ekiBlog.com: beauty for living~ package arrived! beauty for living~ package arrived! thank you so much Frances!! 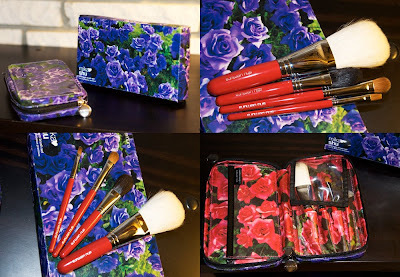 Its special edition 2008 Shu Uemura collab with Mika Ninagawa premium brush set. really great quality brushes, pretty good sizes for a portable brushes. Frances will be having a another giveaway soon so be on the look out! wow these are pretty brushes...lucky! oh, congrats! eki, these brushes are soo adorable! congratulations on winning Eki! ^_^ the brush set looks fabulous! wow, nice brushes with a nice case ya!! congrats!! 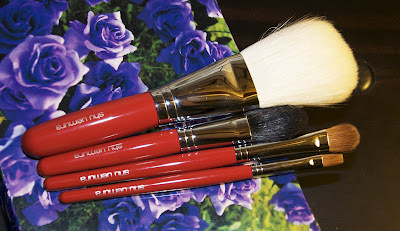 Oh lovely Shu Uemura brushes, congrats! The cases is so totally cute too! pretty! lucky you! congrats on winning! congrats Eki! those brushes are drool worthy! yay! congrats on winning, those are some awesome looking brushes :) enjoy! Wow that was a really good giveaway prize! You won?Cool...Congratulations Eki! Aha!!! Finally, they've arrived. I was getting really worried! Thank you for the thanks =D And, my, those are beautiful photos you took of the prize! I'll have my new contest next week! And congratulations again, Eki! o wow that's a goooood giveaway! Congratz on your win! :) wut a great prize! those brushes really look so soft! If only I could carry you in my little pocket, maybe I'll get lucky too! haha!